Hustler is bold and brash. Neon lights accent the building at all angles and can be seen for miles. Conveniently located on the I-15 at the south end of Las Vegas, it’s less than 5 minutes from hotels mid strip. There’s a ridiculous amount of parking and the valet drop is massive, able to handle 6-9 cars at a time. On busy nights, getting in and out is a snap compared to the single line traffic jam at many other venues. Hustler joined the ranks of Las Vegas mega-strip-clubs in 2010, offering over 70,000 square feet of adult pleasure palace. This makes Larry Flynt’s Hustler club the second largest club in town, just shy of Sapphire’s 71,000 square feet. What really sets Hustler apart from the competition is that the club’s designers packed 3 clubs worth of fun into one venue. 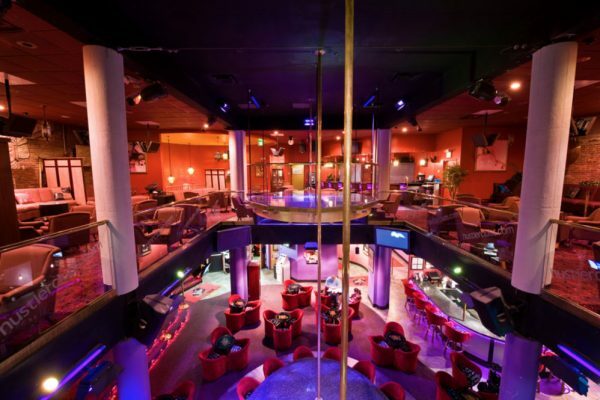 On the first floor, feast your eyes on the main stage where the Hustler Honeys perform pole tricks for your amusement. 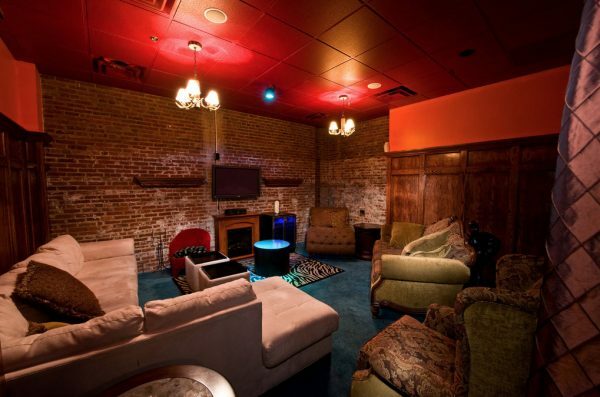 The second floor features over 15 private suites, perfect for spending some one on one time with your favorite girl. 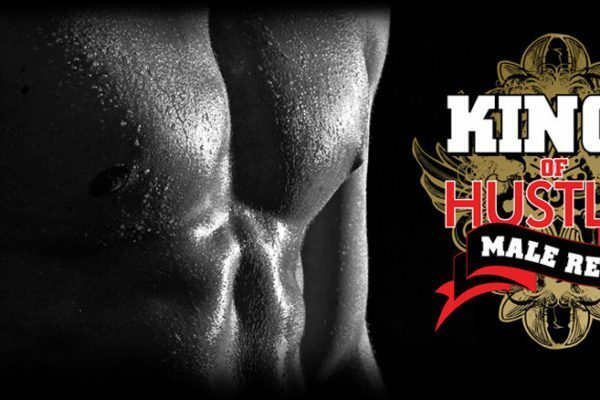 Also on the second floor, from Thursday through Sunday, the Kings of Hustler world class male review runs from 9pm to 1am Thursday and Sunday, and until 3am on Friday & Saturday. The third floor, or rooftop, showcases amazing views of the Las Vegas strip. On weekends and busy event nights, this rooftop venue transforms into an open air nightclub with a DJ spinning beats until the early hours of the morning. So no matter what your vibe, there’s something for everyone at Hustler. Hustler is a massive club, tipping the scales just shy of Sapphire’s mammoth 71,000 sqft!. The cavernous interior immediately impresses with the sheer volume of space filled with beautiful dancers. Try to imagine an aircraft hanger, cram packed with lights, speakers, babes, and booze, and you get the idea! There are ample stages if you want to get up close and take in a stage show. Also, Hustler Gentlemen’s Club features the most HD screens of any club in town. For big sporting events, like fights, football, or basketball, you can bet Hustler not only shows the action but throws a themed party as well. Oftentimes the club will feature specials with all you can drink and free food options. Just call ahead to get the details, as it changes with every event! The music at Hustler covers a wide spectrum, much like the dancers. You’ll hear a lot of House, R&B, and Top 40 most nights. Hustler throws a number of theme parties as well, and the music helps set the scene. Hustler also boasts an open air bistro on the rooftop, with its own atmosphere and vibe. So if you’re not feeling the jams on the main floor, head upstairs for an amazing view of the strip and a completely new take on adult entertainment. On the weekends, Hustler adds another dimension to their lineup. On the second floor, the Kings of Hustler perform to the delight of frenzied females. 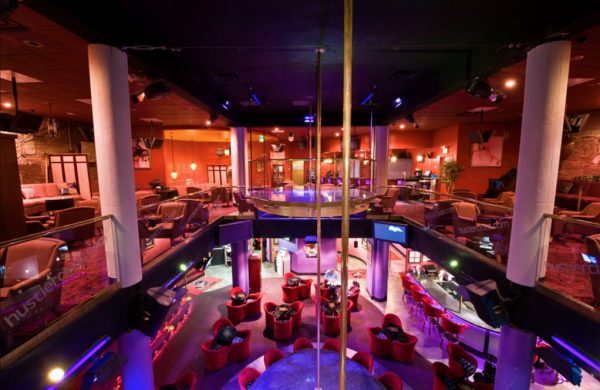 If you want a club where the ladies feel comfortable, Hustler tops the list. Large groups of girls enjoy the show and the staff ensures everyone has a good time. The service and staff at Hustler never disappoints. As the second largest club in Las Vegas, their staff is on point and professional. Hustler throws themed parties regularly, and the staff participates enthusiastic with appropriate costumes and attitude. Whether you’re out to see a UFC fight with some hotties, or celebrating a party holiday such as St. Patrick’s day or Cinco de Mayo, put Hustler at the top of your list. The club and staff enhance the experience! Hustler puts the mega in mega-club, packing three venues into one massive building. Always a great time for parties large and small. We are a group of 7 people (boys and girls) assisting to a wedding of two of them on the 16th of may (tuesday) in Las Vegas. 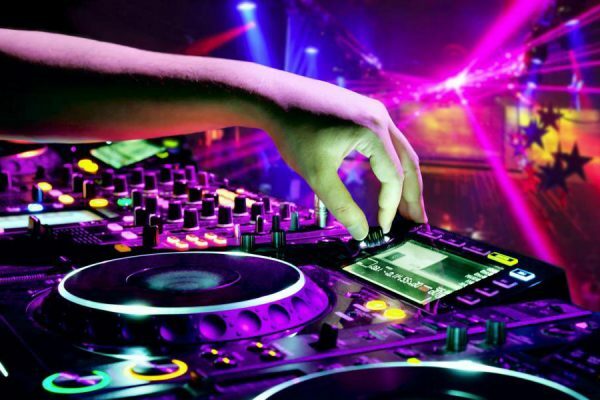 We are looking forward to have a party afterwards in a nightclub where we can see both male and female shows in the same venue, is this possible in Larry Flynt’s Club? Hi Jonaton, yes we’d be happy to assist you. You can call, text or WhatsApp us at +17027066023, or email us direct at deals@wynlv.com and we’ll get you taken all setup!